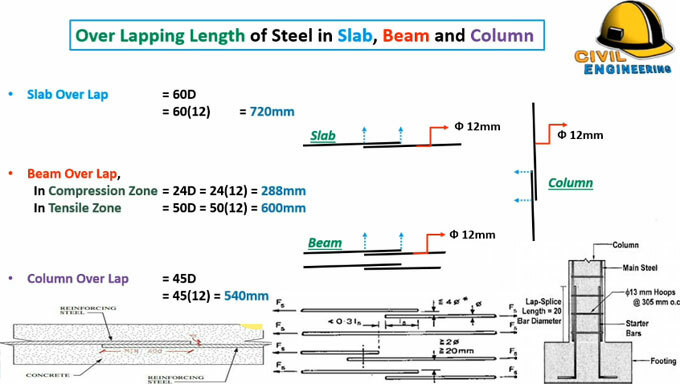 In this civil engineering article, you will get detail information on over lapping length of steel in slab, beam and column. As stated by IS Code 456-2000, overlapping should not remain under 75 mm. Overlapping means the extra length arranged in the reinforcement steel bars. Here, two lengths are overlapped and attached with a wire to increase the length of any steel bar whenever necessary. D stands for the diameter of steel bar. While developing any structure, there are two major types of forces like tension and compression. Each material possesses the strength to retain a specific amount of tension and a compression. A tension force pulls the materials aside. A compression force compresses the material together. In beam, there are two steel bars. One is located at top and one is located at bottom. When the load is delivered to the top portion, it is compressed and when the load is delivered in lower portion, it gets tensiled.